I've sat for YEARS at my job and had issues with my back and hips. Love my Stand Steady! It's the same quality as others I've seen, but at a lower cost. Easy to use. Wish I'd done it sooner. 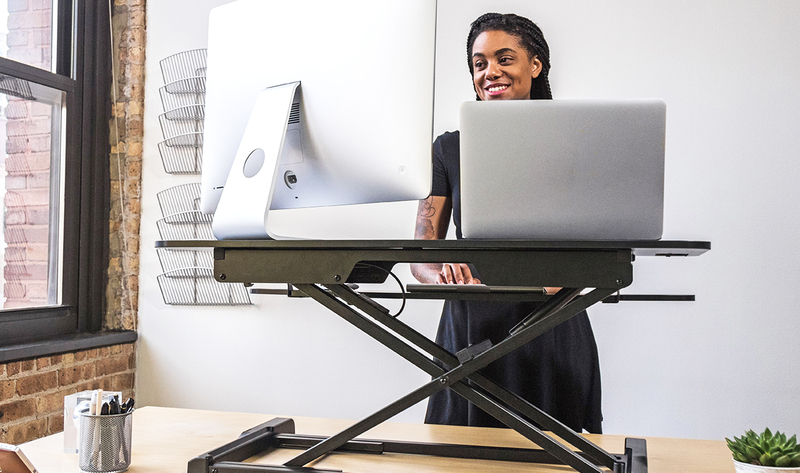 The Steady Stand is a great, moderately priced stand up desk. I like everything about it except that it can't handle the weight of 1 Mac 17" laptop and 1 Apple 20" monitor. I have to use a lot of back to get it up to the correct height. I expected it to come up effortlessly. I am 6' tall. If I were shorter, it might work ok. It looses a lot of its lift the farther up it goes. In the short time using the Stand Steady product, its been helpful for mobility, circulation and some back relief. It's been an attention getter too! So, I guess that makes me an unofficial product promoter. :) Thanks! So far I really like my converter desk. I is a little heavier than I anticipated but I also have two monitors so that is to be expected. As a video producer, I spend lots of hours at my computer editing projects. As much as I tried to consciously sit in a proper position, I kept finding myself slumping and leaning forward--aggravating my lower back and hip issues that already existed. After searching online for a computer riser that would allow me to stand while editing it seemed that the Stand Steady Flex Pro Here 37" model was the best bang for the buck. It was simple to set up (only minor assembly task required) and I am happy with the ability to alternate between sitting or standing at my computer. I wouldn't call it rock solid, but it seems to be sturdy enough to get the job done! Great Price. Strong Pump Lift Assist. Super Tall. So Easy To Use. SALE! $10 OFF FOR A LIMITED TIME ONLY! 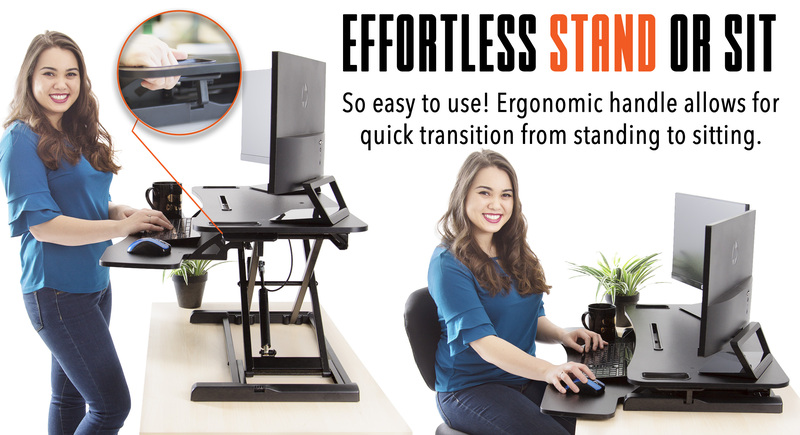 Easily transition your new sit to stand desk in seconds! 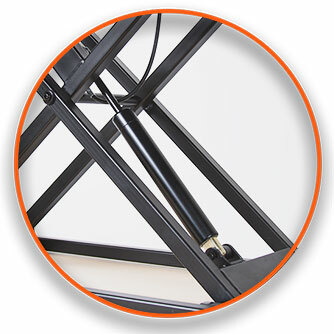 It includes a hydraulic pump lift that allows you to sit or stand with ease. It’s one of the most important features for anyone who wants to relieve back pain (probably from saving the world)! 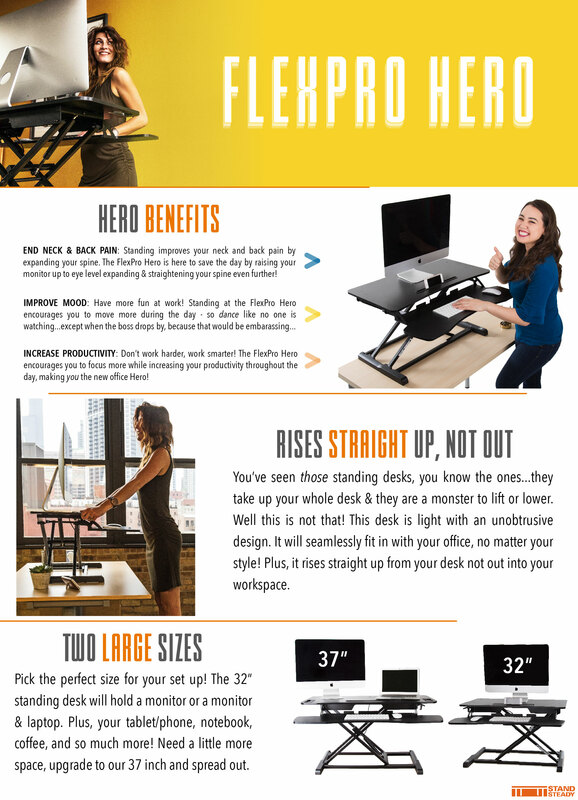 Desks don't get enough credit–they do a LOT of heavy lifting. 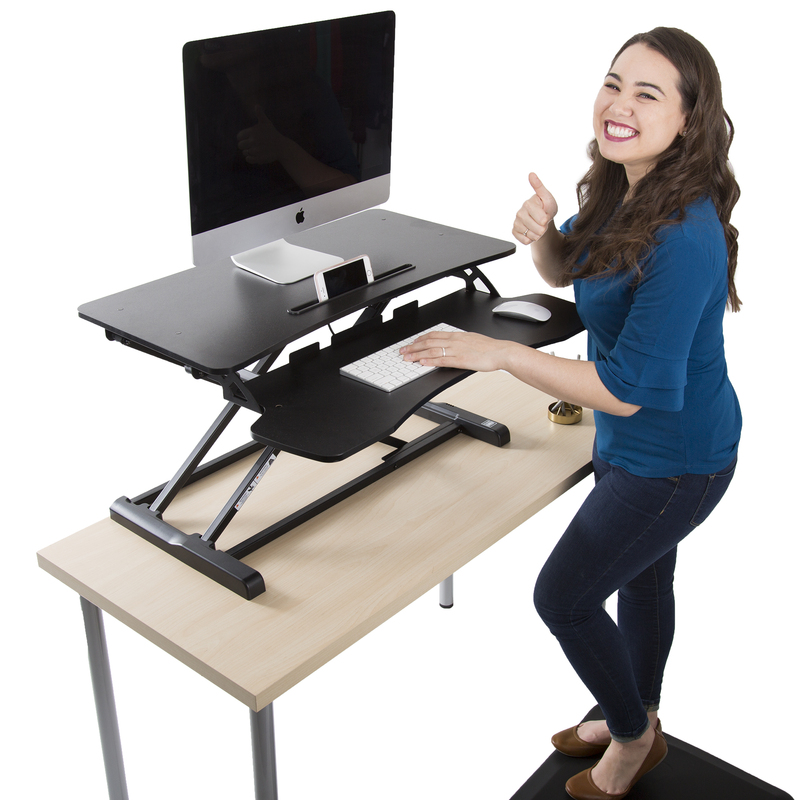 That's why you need a standing desk you can trust to hold all your valuables and breakables! 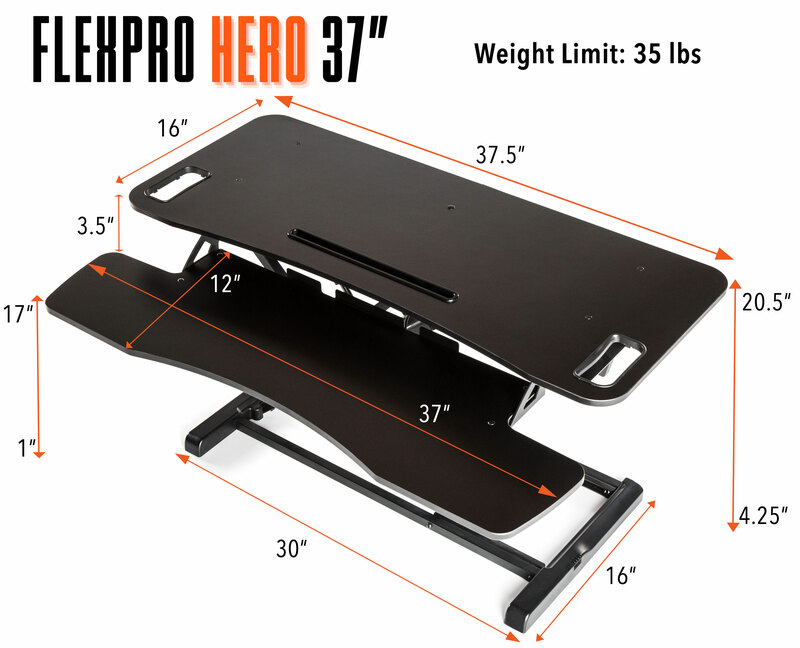 The FlexPro Hero's strong base can hold up to 35 lbs.! 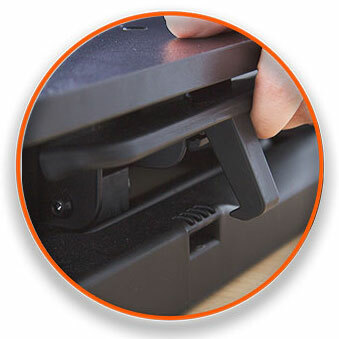 Sturdy enough to hold your 2 monitors, or your beloved iMac, and all of your favorite accessories. Get Organized! With two levels (gaining over 7.16 sq ft) – you will have enough space for all of your cool gadgets. 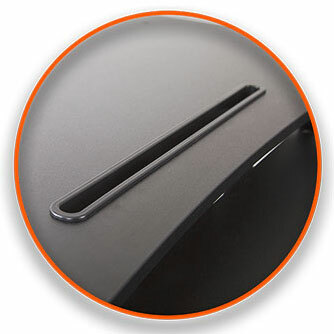 Plus, two levels ensure proper ergonomics while standing or sitting, by keeping your elbows at 90° and your gaze at eye-level with your monitor. 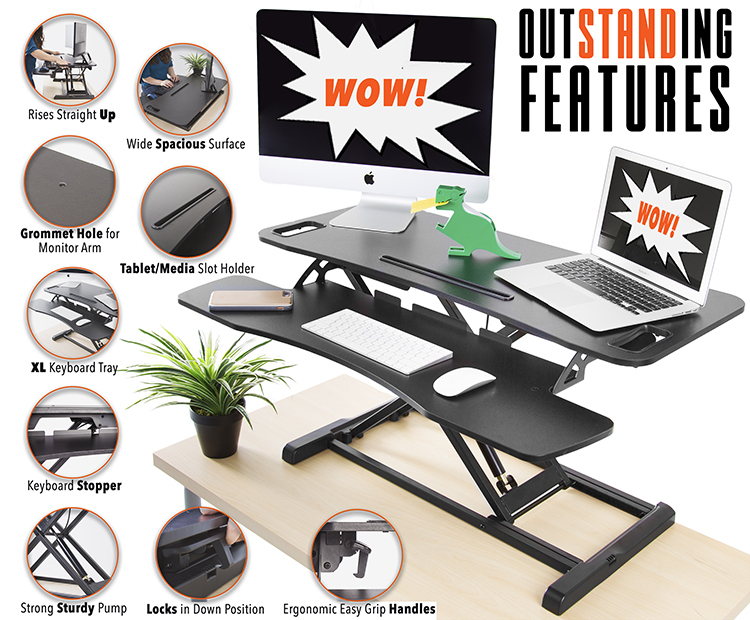 Stand Steady’s FlexPro Hero really will fly above the rest. The top shelf will stand up to 20.5”! 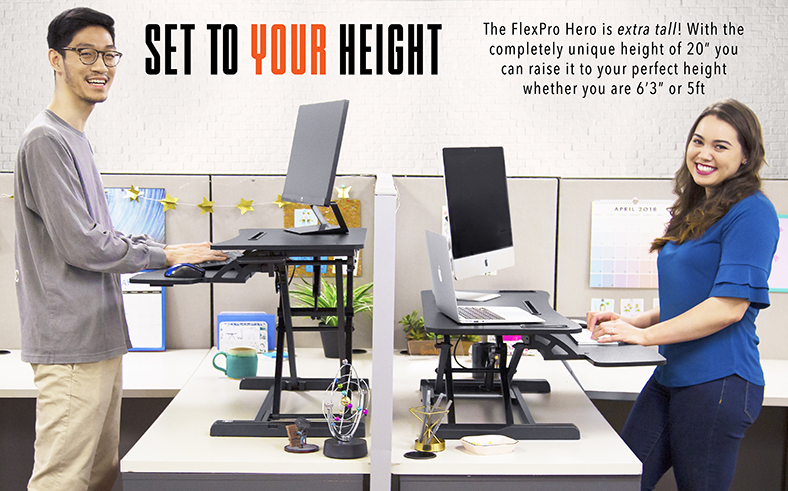 When placed on a 30" under desk (the typical height for most desks and tables) the FlexPro Hero is the perfect ergonomic height for anyone up to 6’3”! 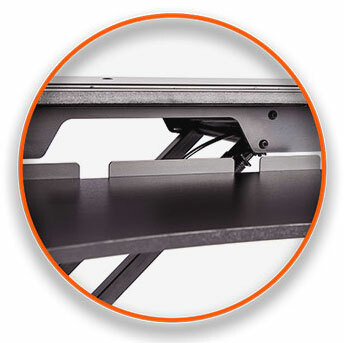 These extra details set the FlexPro Hero apart from other sit stand desk converters! I have only been using the desk a week and feel a tremendous difference. I had neck and upper back pains and this desk has given me relief. As an office we plan on purchasing several more for team members to use. 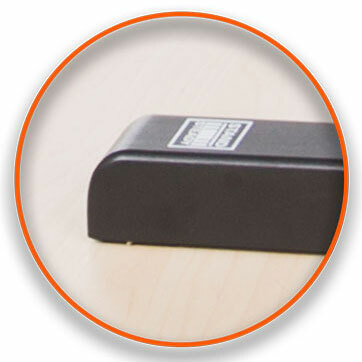 We just purchased the FlexPro Hero Desk Converter. We started with one, and our employees love it! 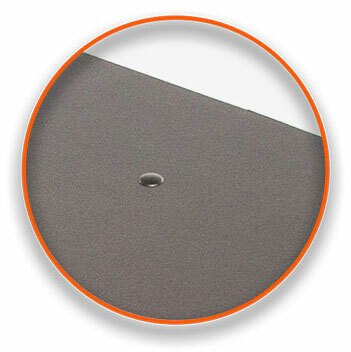 Easy to assemble, exceptionally sturdy and large enough to hold 2 monitors. We will definitely be ordering more! Packaged well and arrived with no issues. Set up was quick and easy (only have to attach the keyboard tray with 4 screws - even comes with the one tool you need.) Had it unpacked, assembled and all set up on my desk in about 15 minutes. I bought this for my home and I am SO glad I did. It's not too bulky but it's not fragile. Well built, functional, and perfect height adjustments. I'm only 5'2" but my husband is 6' and he said it fit him fine too. I would highly recommend. Need a smaller size? Or corner desk? How about power? Looking to place a bulk order or have questions before you buy? send us a message!